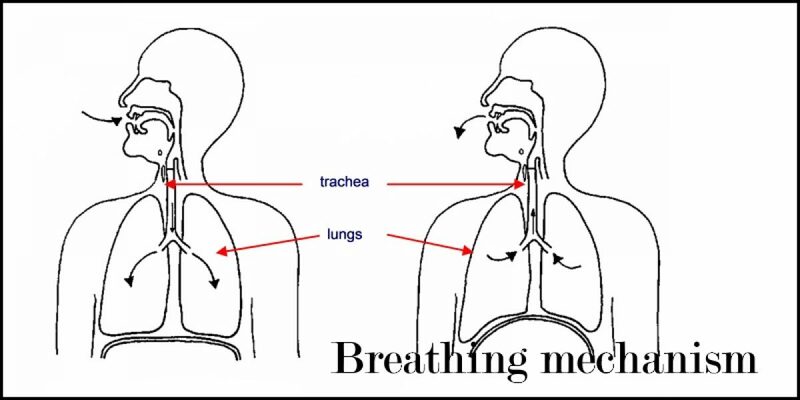 In humans the structure of the breathing mechanism incorporates the chest cavity, or thorax, which is separated from the abdominal cavity by a dome shaped muscle called the diaphragm (see Figure 1). Two lungs are enclosed within the thorax, which is supported by the ribs, and they are connected to the mouth and nose by the trachea. In an adult the trachea is about 11 cm long and 2.5 cm in diameter. It is supported by several horseshoe-shaped sections of cartilage that prevent the trachea collapsing and closing the airway. 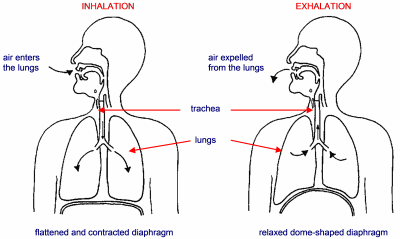 On inhalation the diaphragm contracts and becomes flatter as it is lowered. In addition, the lower ribs swing upwards and outwards as the external intercostal muscles contract. These movements increase the volume of the thorax and the pressure within it falls to below atmospheric pressure. Consequently, air rushes into the lungs to fill this partial vacuum. Relaxation of the external intercostals and the diaphragm allow a set of opposing muscles, the internal intercostal muscles, to return the thorax to its previous size. As the thorax diminishes in size air is expelled from the lungs. All English speech sounds are composed using exhaled air from the lungs, i.e. using a pulmonic air stream.